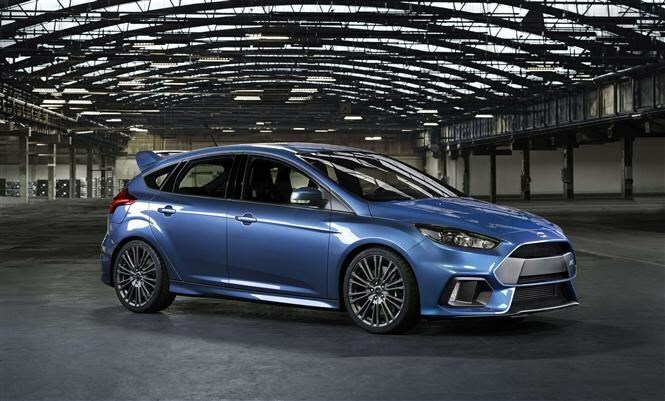 If you’re a fan of the Ford Focus RS (or are one of the thousands that has placed an order already) then the following numbers won’t be new to you, but we’ll repeat them anyway. There’s 345bhp from the 2.3-litre turbocharged engine, a 4.7-second 0-62mph time, and a bottom-line of £28,940. 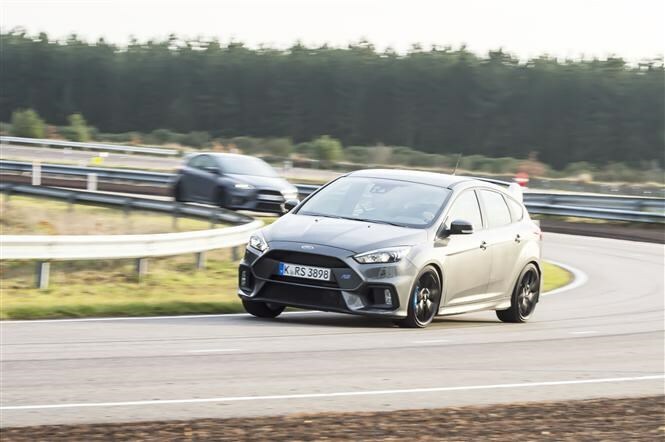 What the black and white figures can’t get across is the way the third-generation hot hatch handles, and for this we had to take a trip to Ford’s exclusive Lommel testing facility in Belgium. 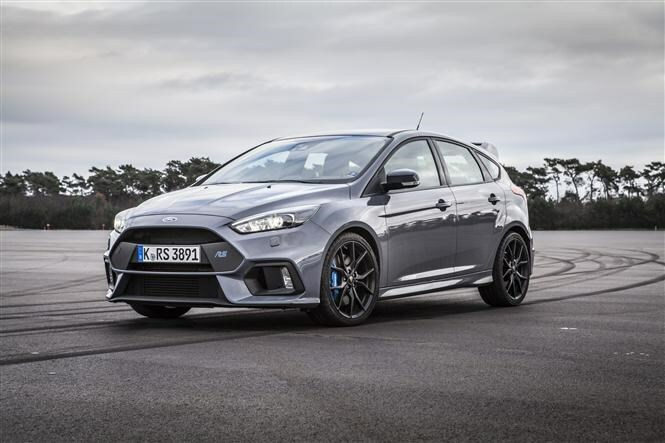 In pictures the styling seems a bit dialled down compared with the previous Focus RS, but in the metal it’s bristling with restrained menace. Subtle details stand out more too - those massive Brembo brakes with their blue calipers, the engraved RS logo on the rear wing, plus that fabulously mean front bumper. The car was silent as we climbed aboard with one of Ford’s test drivers, but the EcoBoost engine soon made itself heard even through a tight-fitting helmet. The two massive tailpipes protruding from the rear diffuser should give you a clue how impressive the new RS sounds on a run, with a rattling cacophony of rally car crackles and bangs. 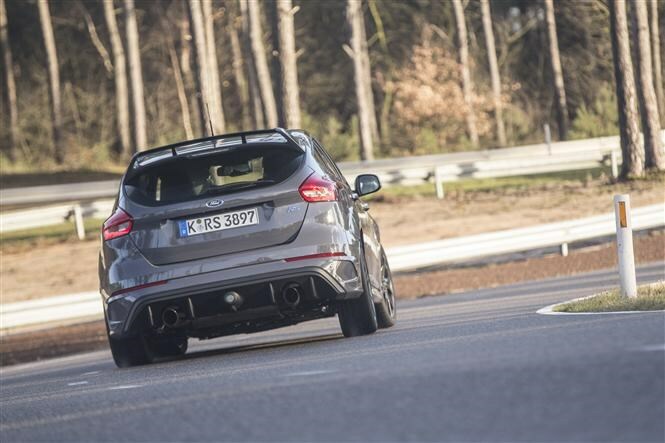 Joining the track via a straight section revealed the car’s prodigious acceleration, which pins you to your Recaro bucket seat ready for the first corner, where the Focus does its best to reshape your face - either through gigantic g-forces or simply a massive smile. 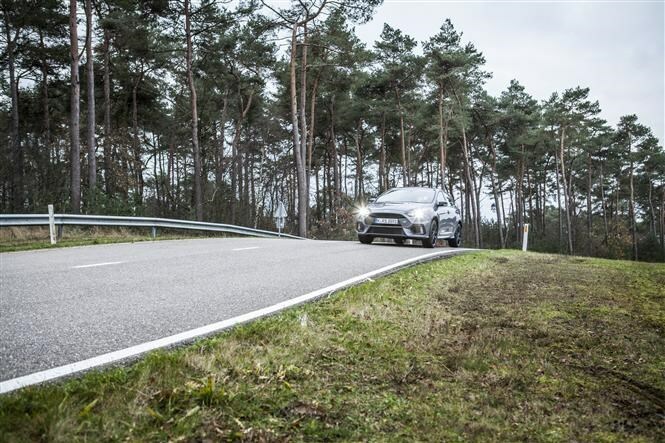 Cornering forces are enormous, as you’d expect from an all-wheel drive car, but there’s no sense of understeer. 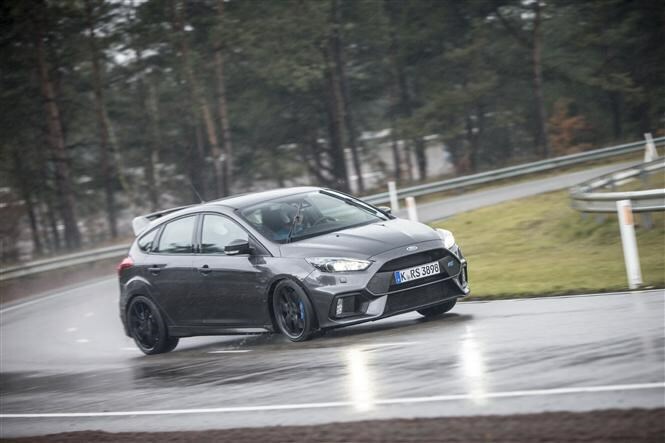 Our handy Ford test driver was able to break the traction of the rear wheels and hold huge drifts before straightening up for the exit of a bend, just like in a rear-wheel drive sports car. In-all it felt like it handled entirely unlike an all-wheel drive machine, yet offered a simply enormous amount of grip. The most surprising element of this dynamic drive was how manageable it seemed; our driver hardly broke a sweat. While this was all tremendous fun from the passenger seat, we won’t know if this translates into the timeless driving experience we’re all hoping for until we’ve got behind the wheel ourselves in Spring 2016. 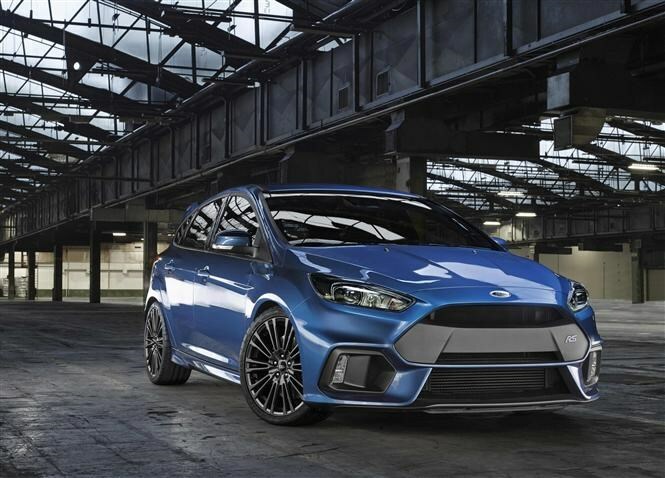 While this is the first four-wheel drive Focus RS - and that’s big news in itself for purists – Ford has roped in the help of Ken Block (of Youtube fame) to help develop the way it drives. His main influence was in insisting that the car features four driven wheels, but it’s the system the car uses to manage its power delivery which is interesting. It's able to send up to 70 percent of its maximum torque to the rear wheels, but crucially, it can send the same amount to just one of them, which makes the tail-out antics we experienced on track possible. 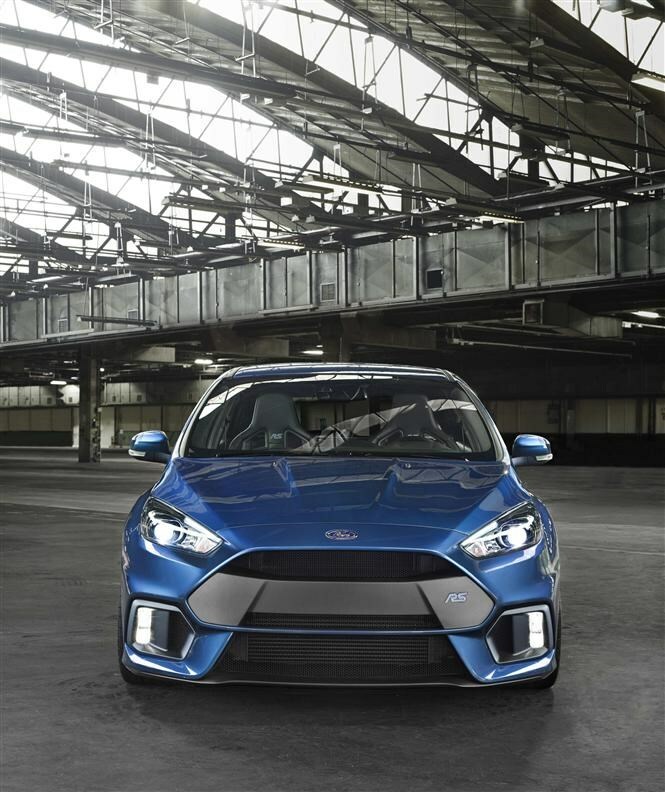 It does this by a clever combination of electric clutches which can almost instantaneously tweak power delivery as required - Ford calls this system Dynamic Torque Vectoring. If the standard handling of previous RS models are anything to go by, it’ll make for a stunning drive. 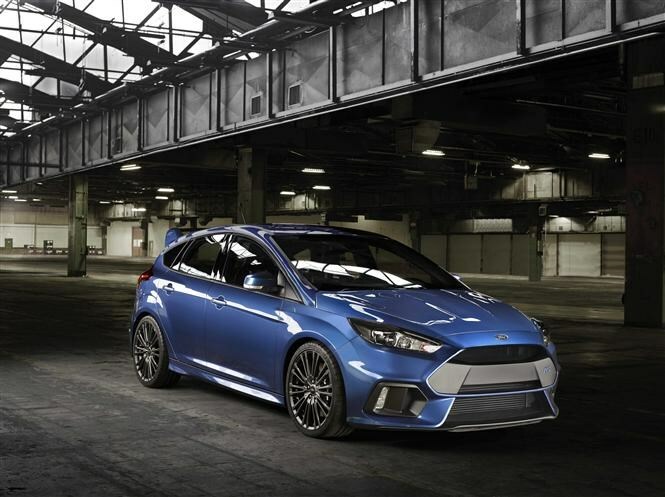 You can check out the previous Focus RS reviews for both the first Ford Focus RS 2002-03 here and the Ford Focus RS 2009-10 here, plus Ford Focus RS for sale here. 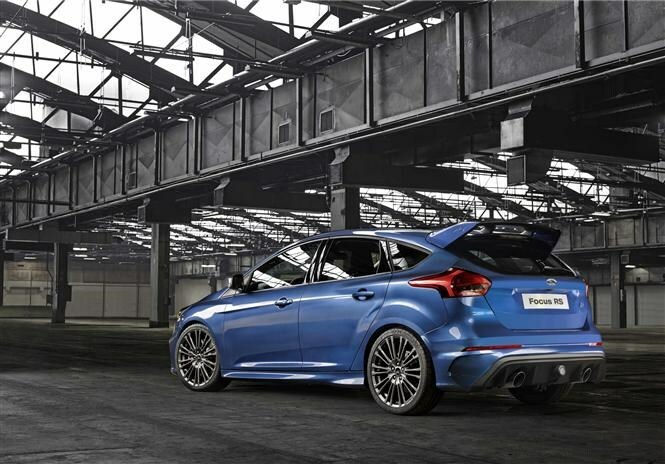 There is also the latest on the hot hatch Ford Focus ST here.